As most of you are reading this, we are probably in the Milwaukee airport getting our rental car for the weekend. Lack of vacation time due to job changes have forced us to fly to Road America this summer, rather than driving as we normally do – thereby saving a couple of days of our scarce vacation time. We both worked full days yesterday, and then caught a flight up at 10:00 last night. Unfortunately, we booked the flight before reserving the rental car; therefore we didn’t know that the car rental counters would be closed by the time our flight arrived. Most experienced air travelers probably would have known that, but we are both novices. I fly about once every four or five years and Susan is not much more frequent than I am. The result was a night in a hotel at the Milwaukee airport. The car rental place opens at 7:00 this morning and I’d like to think that we will be picking up our car shortly after that. Once we do, we’ll make the approximately one-hour drive to Road America. I am hopeful to be well ensconced at the track by the time Practice One gets underway at 11:00 am (CDT), but we’ll see. This will be our third straight trip to Road America since the Verizon IndyCar Series returned in 2016 after a nine-year absence – mostly as a casualty of the open-wheel reunification in 2008. If this trip is anything like the other two, it will not be our last. For years, I’ve always said that Barber Motorsports park was my second favorite track, just after Indianapolis Motor Speedway. After attending the last two IndyCar races at Road America, I would rate Barber and Road America as a tie. If I was forced to break that tie, Road America would get the nod for a few reasons. The first would be the history of the track, second would be the food (and drink) available at the track and then third would be the fact that we can rent a golf cart. When the track is slightly over four miles in length, you can imagine it would be difficult to go from one end of the property to the other. There is also the different geographic region in Wisconsin compared to Tennessee. Birmingham, Alabama is a lot like Nashville – both visually and culturally. The scenery around Barber looks like any scenic spot near Nashville. Those that live in Indianapolis love to eat barbeque when they come to the deep south. It’s like me going to the Midwest and wanting to get a tenderloin. If you can’t get it at home, that’s what you want. Not to knock my own state, but Wisconsin is beautiful. The countless farms you see on the way to Road America look like they should be on a post card. It’s as if the Wisconsin farmers have a competition to see who can have the most manicured farm. The people there are extremely friendly to the point that southern hospitality has nothing over them. We are staying in Sheboygan this year, as we did in 2016. The waterfront there is pristine with countless restaurants, and the entire town is extremely clean and has a crime-free feel to it. The word quaint keeps coming to mind to describe the entire area where we will be this weekend. The area is renowned for Friday night fish-fries. Last year, we went to a great place where we stayed in Fond du Lac. Susan had walleye, while I had lake perch. I remember walking out on the docks at Lake Winnebago afterwards and freezing. It was also cold during the race. I was wearing a sweatshirt and a jacket and it still wasn’t enough to stay warm. I’ve been watching the weather forecasts for this weekend and it keeps changing. A week ago, it appeared that it would be much warmer this weekend with highs in the low eighties. But as time has gone on,the projected highs have continued to drop. Now it looks like highs will be in the upper sixties to low seventies. We are packed for warm and cool weather, just in case. The track is officially considered in the town of Elkhart Lake. We’ve been to the famous Siebkens Resort there, which features fine dining as well as a very famous bar with a rich racing tradition. Two years ago we ate in the restaurant, only to look up and see Mario and Michael Andretti walking in. It turns out that there was an Andretti Autosport function going on in one of the private dining rooms, but it told us we were in the place to be. As for the track itself, there is no shortage of concession stands – each one operated by different organizations with a wide variety of offerings. But there are two staples at each stand – beer and brats. I can grill Johnsonville brats at home, but the people up there just seem to know the secrets of preparing a good brat. Just like it’s hard to get an authentic Philly cheese steak outside of Philadelphia – it’s hard to get a brat that good outside of Wisconsin. Can you tell that I’m excited about going back to Road America? I haven’t even talked about the race yet. If you want to read more about the extracurricular activities at the track and the surrounding area, here is an article that Susan wrote last year shortly after our trip there. As I mentioned earlier, the track at Road America is officially listed at 4.048 miles. There are sharp elevation changes, long straightaways, sharp corners and long sweeping turns. There are many passing zones and most of the drivers will tell you that this is their favorite road course. The way the track runs through some fairly heavily wooded areas, many have compared it to the traditional European tracks likes Spa-Francorchamps in Belgium or Hockenheim in Germany. Here is a video that Susan shot last year from our golf cart on the cart path alongside the area known as Kettle Bottoms, from The Kink all the way down to Canada Corner. This was during a USF2000 practice last year. It just shows what a leisurely pace there is at this storied track. After a long stretch of racing, the Verizon IndyCar Series got a well-deserved break last weekend. Now begins a portion of the schedule when the series seems to race maybe every other weekend. The next five races will be spread out over the next nine weeks and there will be only two of those races run on back-to-back weekends. As we approach the last race in June, I think we will have a pretty good idea who the contenders and pretenders will be by the end of July. Right now Scott Dixon leads Alexander Rossi by twenty-three points in the championship. Dixon has won two of the last three races and is on a roll. But Rossi has been the more consistent of the two, by far. Most are saying that this season will end with another Dixon championship, because he is rarely in the lead this early in the season. That’s the exact reason that I think Scott Dixon may actually lose the championship this year. This has not been a typical year for his Chip Ganassi Racing team. I think Dixon is leading right now due to his superb driving talent and he is leading despite his team. I think as the summer wears on, we are going to start seeing the cracks in his team come to the surface. Rossi, on the other hand, has been more consistent and has been a factor in practically every race – even the Sunday race at Belle Isle, when he made a mistake under braking, while leading with only six laps remaining. Had Rossi held on even for second, he would be only one point out of the lead. But he didn’t so he has a little bit of work to do. Indianapolis 500 winner Will Power had a bad night in Texas and is probably glad to get back to a road course, which is still his strength. Power won at Road America in 2016 and finished fifth last year, after starting second. Scott Dixon won last year’s race at Road America, but had a disastrous outing in 2016 when he started on the front row, but went out with mechanical difficulties after only six laps. The other drivers in strongest contention for the championship are Ryan Hunter-Reay and Josef Newgarden. Hunter-Reay got a huge boost by winning at Belle Isle and finishing fifth at Texas. It wasn’t long ago that Newgarden appeared to be running away with the championship, but he has fallen on hard times and now is fifth in points. Newgarden is only sixty-eight points back, desperately needs a good finish and have some bad luck fall for the front-runners to get back amongst the leaders. That’s not likely to happen in one race. Will Scott Dixon be a repeat winner at Road America or will bad luck bite him again like it did two years ago? Probably neither. What about Will Power? Can he win like he did in 2016 and reassert himself in the championship, like he did by winning the Indianapolis 500; or will he revert to the rough start he endured at the early part of the season? Alexander Rossi showed us that he could bounce back after his mistake at Detroit. He put on another clinic at Texas two weeks ago by finishing third. One would think that a circuit like Road America would be right up his alley. But in two previous starts there, he finished fifteenth in 2016 and thirteenth last year. 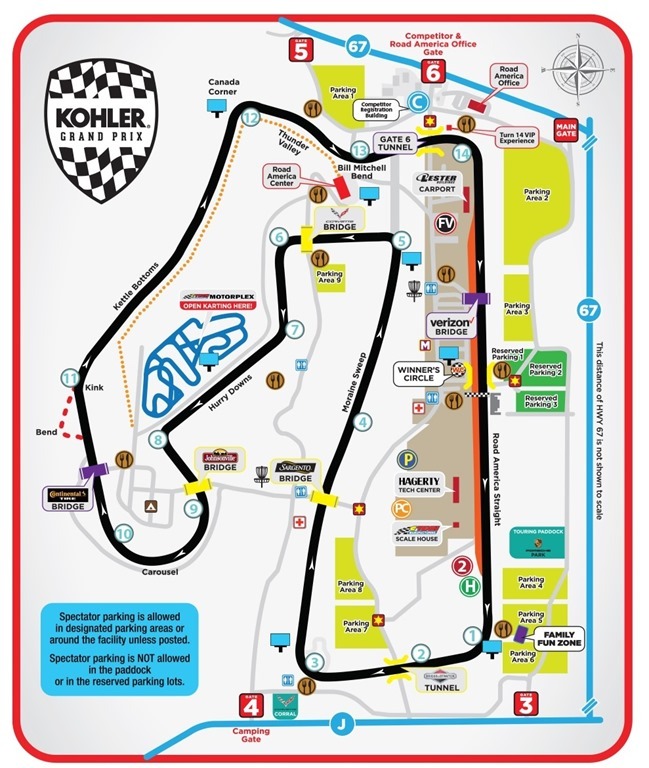 So who will win Sunday’s Kohler Grand Prix at Road America? Will it be one of the point leaders still in contention for the championship, or will there be a surprise winner? My guess is that the most consistent performer this season will finally have his day at Road America and Alexander Rossi will be your winner. Please take note that Sunday’s start time is earlier than normal. NBCSN’s coverage starts at 11:30 am (CDT) and the green flag drops at 12:05 pm (CDT). Also, qualifying on NBCSN will be delayed. While qualifying at the track gets underway at 3:00 pm (CDT) on Saturday, NBCSN will not show it until 5:30 (CDT). As usual when we are onsite, we will have multiple posts here throughout the race weekend. Depending on how early we get to the track, I will try and have a post here before Practice One. If not, it may be near the end of the day. Time flies at Road America and we probably spend less time in the Media Center there, than at any other track. But please check back throughout the day. And remember; for updates, photos and videos – you may follow me on Twitter at @Oilpressureblog and Susan at @MrsOilpressure. Please check back later. This entry was posted on June 22, 2018 at 4:04 am and is filed under IndyCar. You can follow any responses to this entry through the RSS 2.0 feed. You can leave a response, or trackback from your own site. I’m not sure what New Glarus has on offer up there but if you see Belgian Red or Serendipity give it a try. They’re both made with a boatload of Wisconsin cherries and are probably my favorite beverage of all time. They are more like a sparkling cherry champagne than a beer and it will catch you off guard at first, but man it’s a glorious flavor! They have a cherry stout that’s unbelievable too. Belgian Red is a favorite of mine also, along with Spotted Cow. The Cow is good too but I’ve only had it once. Unfortunately we don’t get New Glarus in Indiana but I have a friend who has family up there and always brings back a couple variety cases of bombers. He brought that cherry stout last time and…….oh man was that good! Way more cherry that stouty, a buddy of mine who doesn’t like stouts loved it. I think it’s a seasonal thing though, not always available. An excellent post George. I enjoyed the video. I think you and Susan have managed to experience the essence of Wisconsin during your previous trips. Enjoy the race and the food and please come back again. We’ll keep the light on for y’all. Thank you for the video of the drive around the spectator area along Kettle Bottoms and Canada Corner. For somebody who knows this amazing racetrack only from TV, that’s been a pretty special perspective and a sight to see. Here’s hoping Susan will join you and John as a special guest once again on your next edition of One Take Only! Regarding the race, I remember TK’s drive to P2 in the Ganassi car which happened fairly recently. I feel that he is able of getting a good result at Elkhart Lake again, especially given the Foyt team’s recent upswing in the engineering depart ment. Due to the long straightaways, my guess is also that Chevy might have the upper hand here, as they did at the GP of Indianapolis, which also brings guys like Simon Pagenaud and Jordan King into the picture. Whilst the rest of Germany is crazy about the Soccer World Cup, I have to admit I prefer the picturesque view of Road America. Here’s looking forward to your coverage of the race weekend here on the blog. Don’t forget to have the berry pie!! I too thought the track and its surroundings were amazing. Have fun!